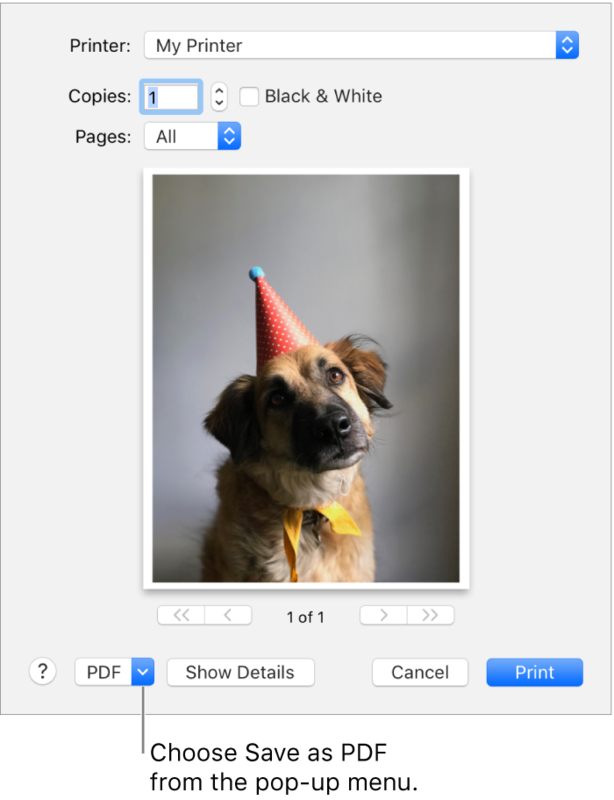 You can share a document with other people by saving it in Portable Document Format (PDF). Even people without the app you used to create the document will be able to read it as long as they have a PDF viewer, such as Preview or Adobe Acrobat. On your Mac, open the document you want to save as a PDF. Click the PDF pop-up menu, then choose Save as PDF. Choose a name and location for the PDF file. Enter the information you want in the Title, Author, Subject, and Keywords fields. Later, you can search on the contents of those fields using Spotlight. To protect your document with a password, click Security Options. You can require passwords for opening the document, copying from the document, and printing the document. Tip: If you’ve made an online purchase and the web page is showing your receipt as a proof of purchase, you can save the receipt as a PDF rather than print it. Click the PDF pop-up menu, then choose Save to Web Receipts. The PDF is placed in the Web Receipts folder in your Documents folder.